Upstate Medical University’s College of Medicine and SUNY’s Purchase College have partnered to create a new program for Purchase graduates to pursue a medical degree at Upstate. The Purchase-Upstate Guaranteed Entrance Program (GEP) for Select Majors was created after Purchase and Upstate signed a Feb. 1 memorandum of understanding to recruit high-caliber students to complete their undergraduate degrees at Purchase and then gain admission to Upstate’s medical degree program. The GEP program is part of Upstate’s larger “forge your own path” program for academically competitive students who wish to major in subjects not typically associated with premed. Upstate will roll out additional partnerships with other SUNY schools this fall, with a focus on other non-traditional majors. Students are accepted to the program from high school. If they maintain a 3.5 grade point average at Purchase, and complete the courses required for regular College of Medicine entrance, they are guaranteed a spot to continue to SUNY Upstate’s medical school and do not need to reapply. The difference between this admission process and majors more typically associated with premed, is that the students do not need to take the Medical College Admission Test (MCAT) and are interviewed by both schools while in 12th grade. Medical school is four additional years of education, once students earn their bachelor’s degree. 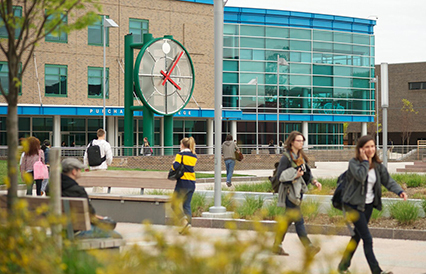 Purchase College, located about 30 miles north of New York City, offers a variety of undergraduate majors including liberal arts and sciences as well as performing and visual arts. The Upstate/Purchase agreement could attract new, qualified students to the medical profession. High school applicants must have a 90 percent average or higher, extra-curricular activities that reflect experience in a healthcare setting and a commitment to service work, and SAT scores of 1360 or higher or an ACT score of 29 or better. Candidates must complete the required Purchase College application as well as interview with the admissions committee at Upstate in Syracuse during his or her senior year of high school. Applicants may pursue one of the following degrees at Purchase: a bachelor of fine arts; a bachelor of arts; a bachelor of music; or a bachelor of science. GEP students must complete requirements for their Purchase degree programs as well as several medical school prerequisite courses, all at a minimum 3.50 grade point average, each semester and overall. Students are also required to complete 40 hours of volunteer service while at Purchase. GEP students do not have to take the Medical College Admission Test (MCAT). Purchase College and Upstate hope to eventually enroll 10 students into the GEP each year.